The screen image displays the data entry table and process buttons. HydroComp NavCad is a software tool for the prediction and analysis of vessel speed and power performance. It also provides for the selection of suitable propulsion system components – engines, gears and propellers. A recent development effort has been undertaken to provide new submarine and SWATH performance analysis in NavCad. This includes new definitions for submerged hull form geometry, and the prediction of resistance and hull-propulsor interaction coefficients. The definition of the submerged hulls of submarines and SWATH vessels in NavCad is a new treatment of traditional parametric descriptions of “body-of-revolution” submarine hulls (e.g., Jackson 1992). The traditional parametric data has been expanded to provide for non-cylindrical sections, as well as increased detail of nose geometry. It also includes definition of single strut geometry suitable for SWATH vessels. 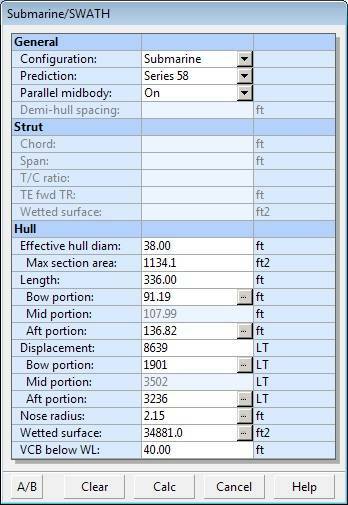 The figure below describes the overall definition of the hull and strut geometry. NavCad now provides the user with three different resistance prediction methods for bare-hull drag – a SWATH-specific algorithm and two submarine-derived prediction methods. One of the submarine methods is based on HydroComp’s recent reanalysis of the Series 58 tests (including the extended “parallel mid-body series”). On-going HydroComp research for submarine resistance includes a study for added wave-making resistance when running at shallow depth. Added resistance for appendages will leverage NavCad’s existing prediction functions. The standard framework for NavCad is built around surface vessels that follow prescribed prediction methodologies. The Submarine/SWATH predictions are treated as supplemental calculations that are “defined” outside of the standard framework. The appropriate performance results array will be calculated and locked, and the prediction method identified in the “Defined” caption. This new extension for NavCad is the first of a number of focused “modules” to the standard prediction framework. On-going module development for similar new capabilities includes re-analysis of barge train resistance and new hybrid wave-making codes. The new Submarine/SWATH features are available immediately to all NavCad customers with an active update subscription.